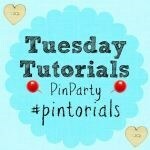 A big welcome to Week 31 of the Tuesday Tutorials Pintorials Pin Party! Today is the first day back to school for my children! I am so pleased that I will have more time for myself again and start doing more cooking posts! This week I am featuring healthy food! Schooling a Monkey has written a post about apple chips. I did one previously too (read here for the recipe) and it is quite hard work. But the end product is fabulous! So it is definitely worth the effort. Next is from Kiddo Hut, she has made a snow fungus red dates dessert. It is very healthy and soothing especially for the throat. Finally, Wolves in London grew her own plum trees and made plum chutney! It looks extremely delicious! Don’t forget to pop by to take a look at Kate (Autumn crafts for preschool), Anna (Paint activities) and Hodge’s (Best I craft) blogs to see who is featured this week.